USAopoly will release a new edition of Monopoly featuring characters from the popular My Hero Academia anime series. 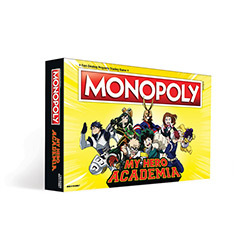 Monopoly: My Hero Academia features an all new board with artwork of the characters and tokens representing various characters� uniforms, such as Deku�s Mask and Baku�s Grenade Glove. Traditional Houses and Hotels have been rebranded Rewards and Trophies, while Custom Chance and Community Chest decks have been renamed Go Beyond! and Plus Ultra! Monopoly: My Hero Academia is for 2 to 6 players, ages 8 and up, and plays in 60 minutes or longer. MRSP is $39.95 with a planned May release.